Everybody’s Gone To The Rapture was first introduced to me in a secret room, upstairs in Sony’s E3 booth last year. What I saw there was a very solid concept. This was a game that wouldn’t have any (visual) violence. Developer The Chinese Room wanted to tell a story, and just happened to use video games as the medium because they believed it was the best way to immerse their audience in the story. But is this really the best way to go about it? Would a movie be a better fit? Let’s find out. Obviously, I will not go into major plot points here, as the story is best when discovered by the gamer themselves. However, I will say that if you don’t hold others in high regard when faced with a crisis situation, then you will probably not like this story very much. The entire reason the end of life on Earth is brought about is due to one character’s increasing loneliness. Even the ending can be seen in this way. Yet, The Chinese Room did an excellent job at crafting a story that can be interpreted in multiple ways depending on which way you approach it. For example (okay, some spoilers ahead in this paragraph! ), although the world becoming devoid of all but plant life can seem bleak at first glance, there is more to it than that. The story can be seen as one of transcendence. Humanity, and indeed all sentient life, appears to have fused with this entity that is at the center of the story. Some people may even be jealous by the way that this world ended, because humans have seemingly moved on to something far greater than themselves, while here in the real world humanity’s greater purpose may never be revealed to us. One of the most unique aspects to Rapture is that the in-game characters are never actually seen. While this may be partially due to the fact that The Chinese Room is a smaller developer, I believe it is a genuinely artistic choice done for dramatic effect. When you play as what is effectively just an observer to a scene, your mind has to fill in some details such as how a person feels based solely on their voice. Thankfully, the voice acting in Rapture is immaculate. I don’t think the range of emotions experienced in this story could have been any better produced. You can tell immediately when any character is happy, sad, angry, or scared. Do not go into this Rapture game expecting to see any epic, apocalyptic set pieces; there are none. 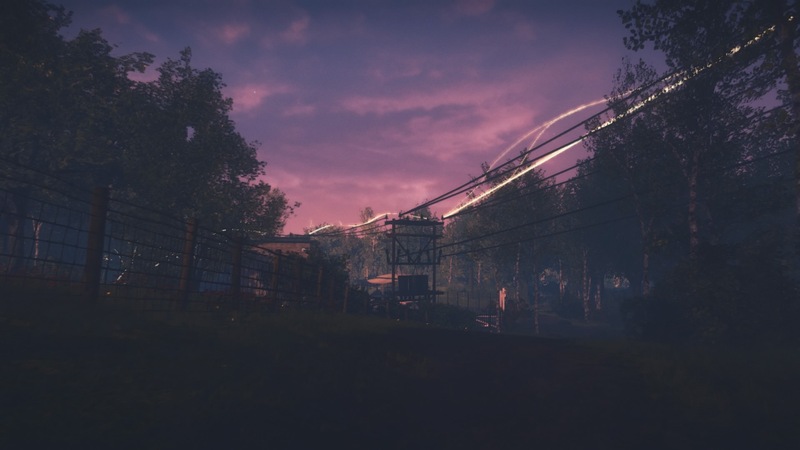 I wouldn’t hesitate to say that Everybody’s Gone To The Rapture is a game that you play to see if your imagination is as good as you think it is. Going off just audio cues and little else, the player is tasked with experiencing the story of a dozen or so people during their last few moments on this planet. As The Chinese Room has stated before, they do not think lowly of gamers, and feel that we are capable of picking up on subtle messages within the game’s subtext, such as an unstated feeling of loneliness by at least one character, or the neverending love between a couple who have been split for a few years. Graphically, Rapture looks fairly pleasing. It utilizes the Crytek engine, so naturally the game will look very nice. I wouldn’t call the graphics jaw-dropping, but the environment is very pleasant to look at and gives off the feeling of a quaint English village in a realistic fashion. There’s even weather effects such as lightning during a thunderstorm, and everything outside becomes sopping wet in a believable manner. Water and cloth physics are decent, but feel just a little unrealistic. This is a minor issue, and mixed with a few small graphical issues, the game engine generally runs smoothly and doesn’t inhibit the experience. One aspect to Rapture that may turn off some gamers is the lack of any real interaction with the environment. The only thing you will ever do in your time with Rapture is open hundreds of doors, rotate your controller in a way that starts a cinematic, and start playback on tape machines and telephones. There’s really not much else you can do. The story trots along at a steady pace, and the world’s fate has already been sealed. There are no puzzles to solve, no branching dialog or story options, and nothing stopping you from staying on the main storyline with little distractions. The main story can be experienced in approximately 4-6 hours, depending on how rushed you want to make it through. If you’re like most gamers, however, you likely want to get every penny’s worth out of this, and I could see gameplay extending to eight hours if you take the time to find every single cinematic and recording. But the lack of even basic puzzle elements, like say to open a locked door, will turn away gamers who are looking for some sort of traditional game elements. You already know if you want to buy in on this experience. If you’re looking for a gory, bloody, violent apocalypse, well, there are already a myriad of other titles to choose from. But if you’re looking for an interesting method of storytelling full of drama, then you will want to check out Everybody’s Gone To The Rapture. This is a video game as a piece of literature. Some may call it art, but I like to think gaming has evolved beyond such a contemporary definition. The Chinese Room had a story to tell, and they have done so in such a unique fashion that I eagerly await their next adventure.